Mic drop on a Tuesday! 93-94 POINTS, superb 2015 Bordeaux vintage! Best price in the galaxy! It boggles the mind to think back on how many Grand Cru and Grand Cru Classe St. Emilion wines we tasted last Spring. 150? At least 100. We picked….maybe 3. Were they $80? $150? More? Nope. We picked THIS. THEN Suckling gave it a nice, big, fat kiss on the lips with his whopping score, well-deserved of course! Love it when a plan comes together! Man, the 2015s are stupendous. Big, rich, powerful but a bit softer tannin-wise and a little rounder than usual. A little more finesse. We LOVE them (especially when we import them directly and cut out all the middle guys). 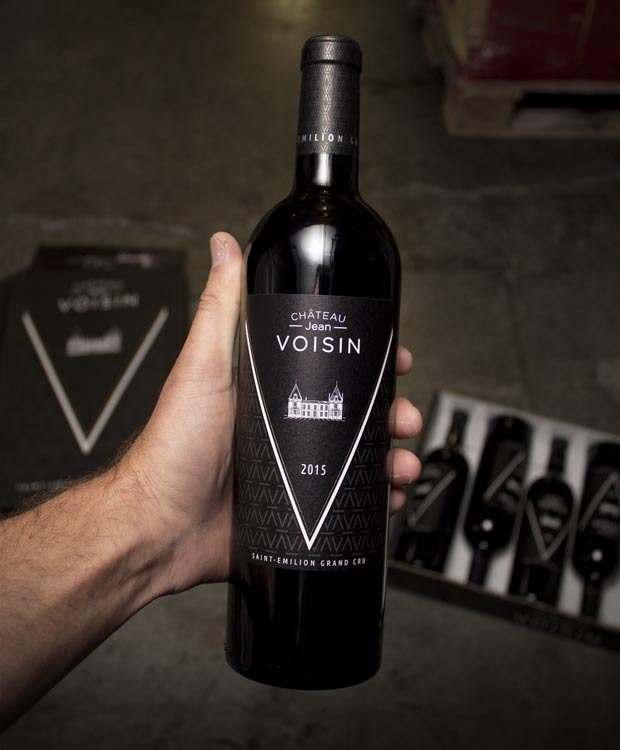 Chateau Jean Voisin began in 1902, and was actually started by a Bordeaux wine merchant. In the last decade or so, it has skyrocketed in quality, but not priced (yet) to match the big dogs (think: $150-$300+). So, what’s it like, you ask? WELL….HUGE! Cherry jam, sweet mint, clove, pie crust, and ALL, as noted, in a sleek and silky package for such a flavor-packed St. Emilion! Did we mention 93-94 points?? Not a lot of this! Killer terroir, small production, modern winemaking and a perfect growing season, that is a recipe we can't ignore! The story begins in 1583 when Jean Voisin, a notable resident of Saint-Emilion, where he later became the mayor for two years, established his residence on a small unexplored, yet preserved, piece of land. He quickly identified the terroir quality and its infinite promises clearly proven by his illustrious neighbors. On the heights of Saint-Emilion, invigorated by its winds and the life that unfolds there, Jean Voisin’s vines began to grow. The 15 hectare vineyard is situated on the plateau of Saint-Emilion. Its blue clay subsoil is characteristic of exceptional terroirs similar to neighbors Chateau Cheval Blanc, Chateau Figeac and Petrus. Our advantage is an unsegmented vineyard surrounding the Chateau, tended to with passion and precision as if it was a garden. We analyzed 19 plots, with each one their own unique identity that contributes to the richness and complexity of our great wine. We work each plot of land differently according to its potential and how it can yield the best product. Merlot comprises 95% of our wine and beautifully expresses itself on the terroir and imparts the wine with a fruity taste and silky texture. The other 5% is our complex and elegant Cabernet Franc. Smoked Duck breast over wild mushroom risotto!